Waylon has an extremely pressing problem: he has to find a home for a friendly but undistinguished mutt, Eddy, before the dog is sent to a distant animal shelter. Like many 10-year-olds, he has some bright—but improbable—ideas. Perhaps, if he could build one, the dog could live in an igloo. There’s plenty of snow in Boston to make one. He collaborates with his not-quite-a-friend, Baxter, who’s just as concerned about Eddy and could be a friend, if Waylon would let him. Waylon, in his analytical way, has decided that Baxter might have dangerous criminal tendencies. Actually, Baxter’s mildly nefarious scheming is just his way of figuring out how criminals think, since he fully intends to grow and become a criminologist. As the two boys explore (with a little guidance from loving parents) what it means to be a friend and how they can somehow help Eddy in a responsible way, their friendship believably grows and strengthens. The feel-good conclusion would probably never happen in the real world, but it is just right for the audience. 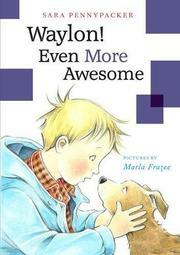 As in Waylon’s first outing, an amusing sprinkling of the curious scientific information that occupies his thoughts is included, along with Frazee’s frequent, attractive illustrations, in which both Waylon and Baxter are depicted with paper-white skin.